Indian Premier League (IPL) 2019 continues to dominate the Broadcast Audience Research Council of India (BARC) sports genre ratings for Week 14 (March 30 to April 5). 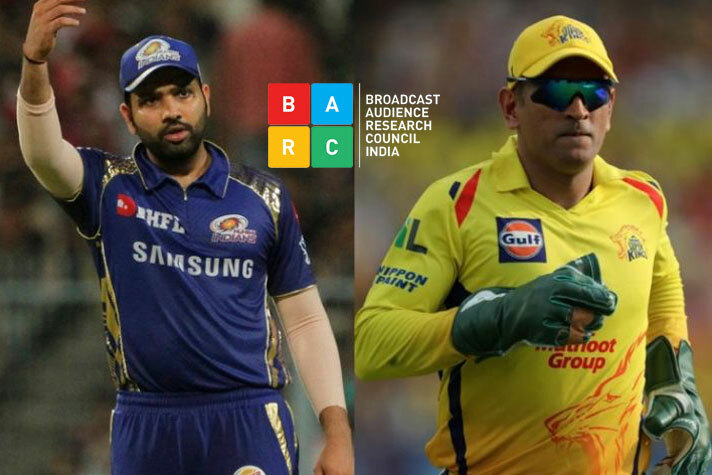 Mumbai Indians versus Chennai Super Kings match on April 3 remains the most watches show for the week with 19,179,000 impressions on Star Sports 1 Hindi. However, channel ends up losing some impressions over the No. 1 show (MI vs RCB match) for the previous week. Every other top five show is an IPL match on Star Sports 1 Hindi. Albeit, in each of the top five position the channel ended up losing eyeball even as the league action intensifies with each passing week. Royal Challengers Bangalore versus Kolkata Knight Riders match on Friday last is an exception. Star Sport 1 Hindi is the only gainer as the other top five channels have marginally lost out on the eyeballs. In other developments, free to air Star Sports First has lost its third position to Star Sports 1, which has progressed the third spot behind Star Sports 2. For the second successive week it’s all Star Sports group channels in the top five position. WrestleMania LIVE on Sony Sports cluster last Sunday could not match the high audience of the IPL. The Star Sports and IPL will continue to dominate the BARC ratings in the coming weeks. Even as IPL is setting new benchmark for television audience, Star Sports will be working overtime with its creative presentation to prevent any slide in the live audience.